I'd seen this beer at my local Kroger for months and months and months. At $8.99 a sixer, it seemed to be calling out to me. I just never got around to taking the plunge and buying the beer. However, that changed recently. And, well, here we are. Up for review today is Uinta's Baba Black Lager. This is my first black lager, so, going into the brew, I had no idea what I'd find. If you pull up a chair, open a up a beer, and give me some of your time, I'll tell you exactly what I've found. Uinta Brewing Company started in Salt Lake City in 1993. Its name is derived from the Uinta mountains, found in Utah, and many of its beers have names referring to the state's symbols and culture. After moving to a bigger facility in 2001, to better accommodate the growing demand for their product, the brewery underwent a label redesign in 2010/2011. This design, done in preparation of Uinta's 20th anniversary, provided the brewing company with the opportunity to clearly define three separate product lines: "The Classic Line, Organic Line and Crooked Line." To see more about the company's history and their environmentally friendly practices, click here to go to their "Our Story" page. 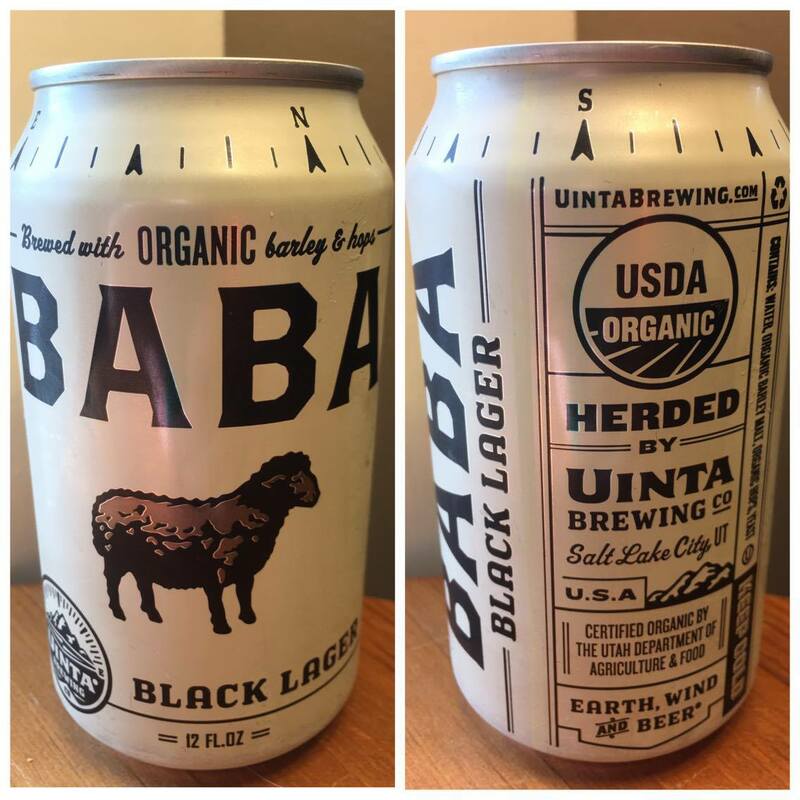 As far as Baba Black Lager is concerned (click that link to go to Uinta's "Our Brews" page, on which you can find Baba), it's in the company's Organic Line. The award-winning beer is "Robust and smooth...," has an ABV of 4%, and is available year-round. It smells robust. I'm sure some of its organic malts are roasted. It has that lovable coffee/chocolatey aroma that you'd find in a porter or a stout (its actually more akin to a stout than a porter, but I've included both so you'd get the idea). 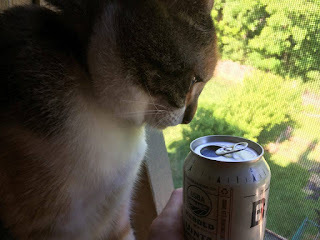 Purrl enjoyed it--she gave it six whiffs. I lose the beer in its flavor. It tastes like a watery stout. It's robust, yes. And flavorful. But it's also washed out by the easy drinkability of a lager. There's also an odd, almost cream cheese bite in the finish. While this is dark, robust, and roasty, none of this is done in a way that I usually expect. On the mouthfeel front, Baba Black Lager is very thin. Crushable like a lager should be. There's no rapid release of carbonation that fills your mouth. I don't know why, but the lager makes me think of fishing for crawfish as a kid in Oklahoma. I can't remember which friend's house I was visiting, but the two of us ventured to the small pond at the end of his street at sunset. I don't know how long we stayed there--it couldn't have been more than thirty minutes--but, at the time and looking back on it now, it felt like hours. I didn't find any crawfish, but my friend did. Don't worry, though. It was totally a catch (with our hands) and release scenario. 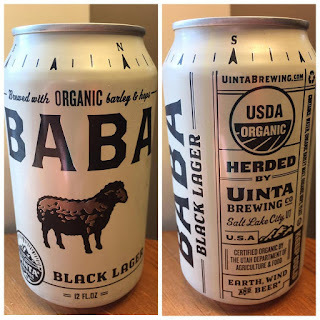 Regardless of the nostalgic thoughts Baba Black Lager conjures up, I'd be lying to you if I said anything other than that this entry in Uinta's Organic Line didn't do it for me. I'm giving it a 6.0/10. The lager's finish did me in. The brew isn't terrible--it's won awards for a reason--but I cannot bring myself to recommend it. If you like it, great. But I don't.